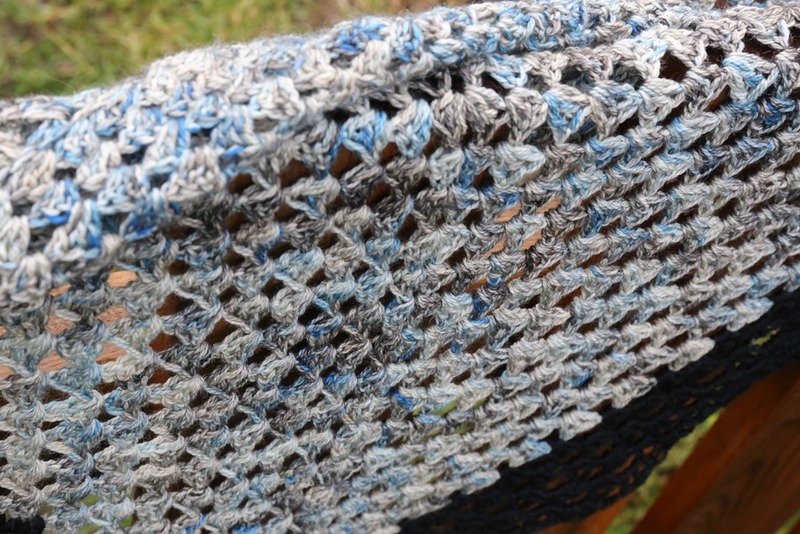 It has been a while since I have had a chance to write a finished objects (FO) post and I am not sure that I have ever written a FO post about crochet. If I have ever written a crochet post, it was about this scarf (which is pretty super stinking cool). I am definitely not going to turn over a new leaf and start crocheting. This is mostly because it really aggravates my right wrist but this project was completely enjoyable. And fast?! I did not expect it to be finished in under two weeks. This project was one that I ear-marked for the #craftfor20 over in the Tiny Paper Foxes Ravelry group. I thought it would be a great way to motivate myself to work on it (given my issues with my wrist and crochet) alongside other people who are working away on their crafting each day for the month of February. In the space of less than two weeks, this was finished! Washed, blocked and ends woven in. I think that is come kind of record for me! So … Why this pattern? Why this yarn for this pattern? In full disclosure, I received this yarn from Stitch Craft Marketing and A Good Yarn Sarasota for review. A Good Yarn Sarasota has yarns exclusive to their shop in Florida that are hand-dyed using sea life as the inspiration. This particular yarn is Black Tie Affair Opera in colourway Sea Turtle. Courtesy of A Good Yarn Sarasota, this lovely yarn is Black Tie Affair in Sea Turtle. I swatched with this yarn for a couple of days after receiving it but nothing really stuck for me. The fabric didn’t sing with anything I swatched for over those days. 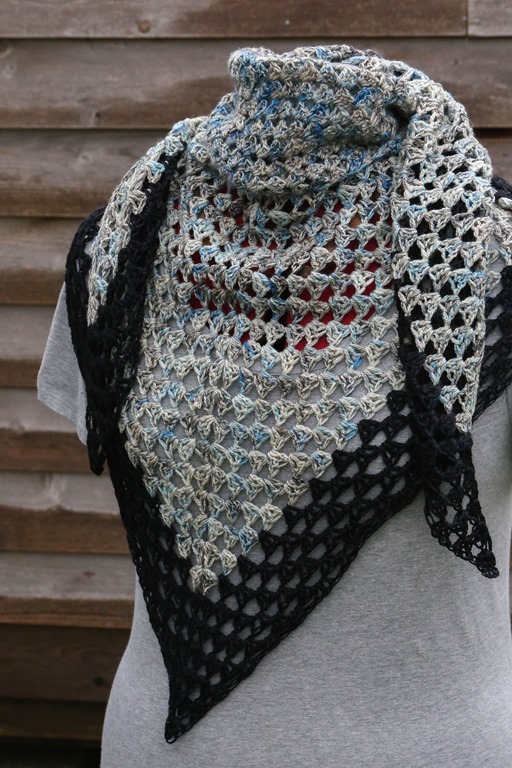 On my Ravelry searches for patterns I thought might be possibilities, I continually came across this super simple shawl pattern (linked below). Over and over, it popped up in my feed. Finally, I decided to grab a hook and try this pattern. 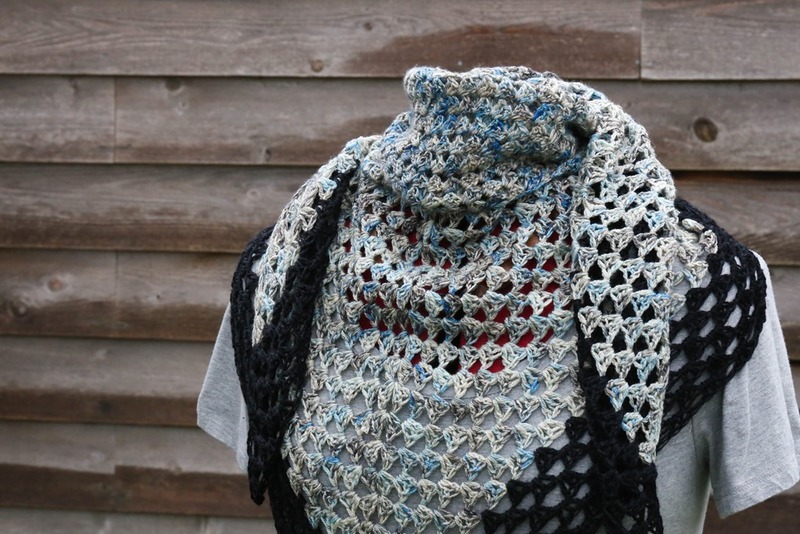 In all honesty, this particular pattern has been sitting in my favourites on Ravelry for eons – definitely since the pattern was first released. 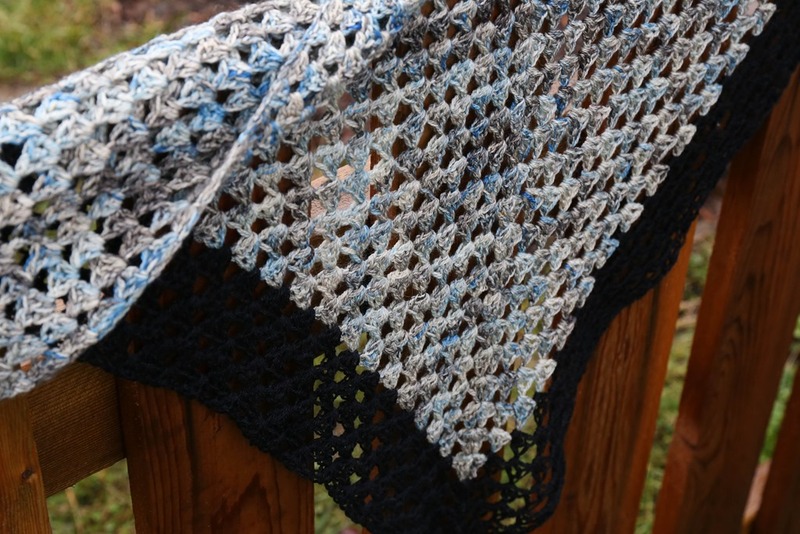 I am not a fan of crocheted shawls but something about this modern take on a granny square got me thinking about the possibilities. Larger hook, increasing as the shawl grew bigger, and yarn held double. As I worked out, I increased by 0.5mm in hook size every time I added a ball of yarn. The first skein of yarn was hooked at 4.00mm, the second at 4.5mm and the black border at 5.00mm. 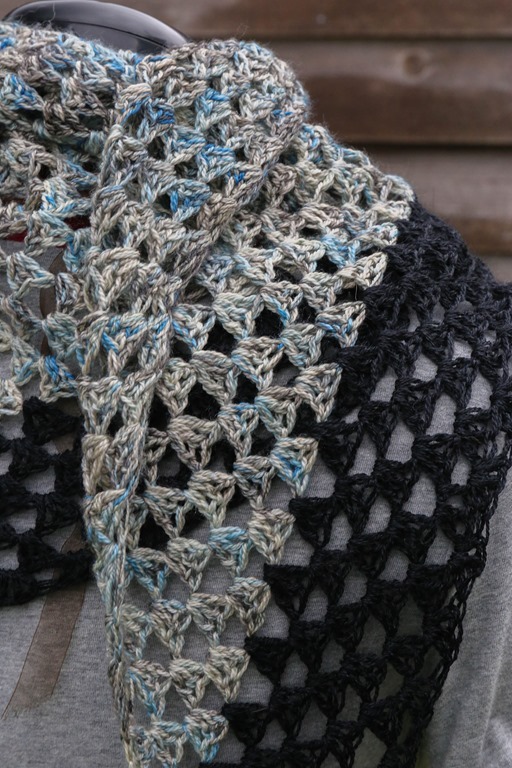 The result is a drapey, open and lacey shawl that is oversized, wearable and elegant. Perfecto! Held double, the Black Tie Affair Opera is an interesting blend of 50% Superwash Merino, 30% Cashmere and 20% Silk. The yardage is quite generous at 400 yards per 50 grams. The two skeins that I was sent were lovely to work with but different colours. The bright blue that you see around the neck was not as present or as saturated in the second skein compared to the first. 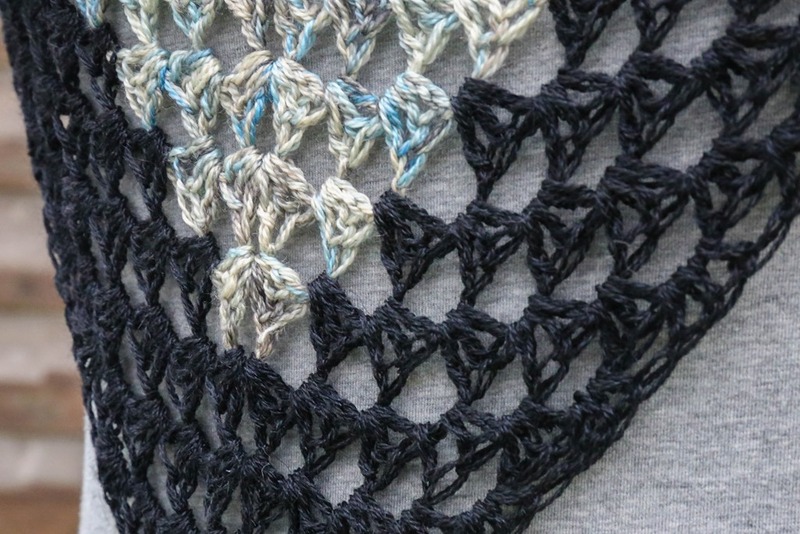 The grey and black speckling in the skeins meant a black border would really set this shawl off, though, and I decided to run with that since black coordinates with 99% of my wardrobe! I also needed a wee bit more yardage to increase the size of the shawl slightly. The hightlight of the Opera for me was the sheen and lustre of the silk – in the finished shawl, it appears elegant and delicate. 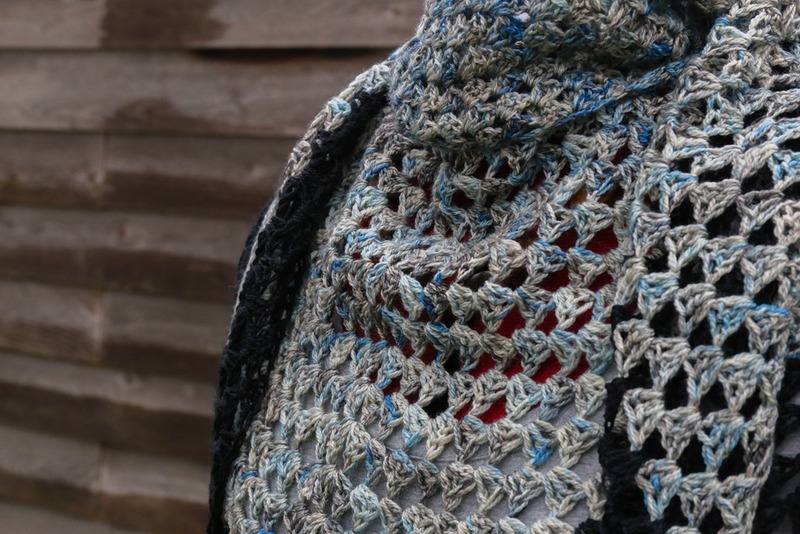 I rarely think of crochet as delicate but this shawl is just that – I put it on this evening to wear with a navy blue dress in my limited wardrobe and it set the shawl off perfectly. I am so looking forward to wearing these items together. Thank you to Stitch Craft Marketing and A Good Yarn Sarasota for the chance to work with this lovely yarn – it was a pleasure and I’m looking forward to wearing this in the coming Spring months! Previous Post textured yarn revisited. Next Post textured yarn on steroids.